I used the sport ball pan from Wiltons, followed the directions in the box on how to make the cake used the Wilton decorators buttercream icing for the decorating. I frosted once, let crust and then frosted again both with a medium consistency. After the second crust I smoothed out with wax paper. 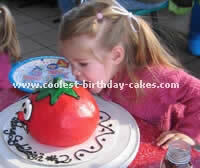 The ‘leaves/stem’ eye nose and mouth are all buttercream ‘stiff’ so that it will stand out. I outlined everything with black writers icing (in tube). It was a hit and the two year old went straight for his nose! 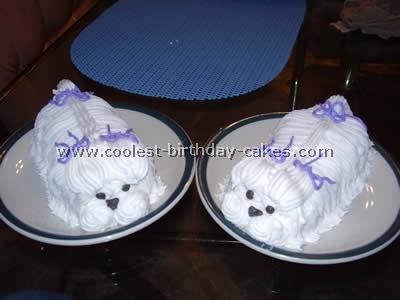 Thanks to this site for kids birthday cake ideas. It is great! 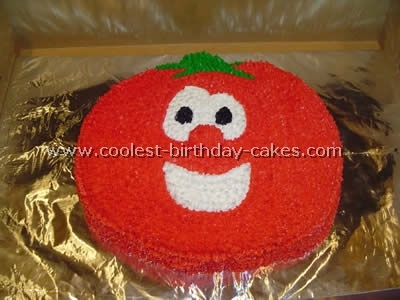 My best friend’s little girl was having a Veggie Tales party for her 2nd birthday. 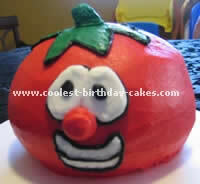 I made this Bob the Tomato cake out of the Jack o’ Lantern Halloween Cake pan. 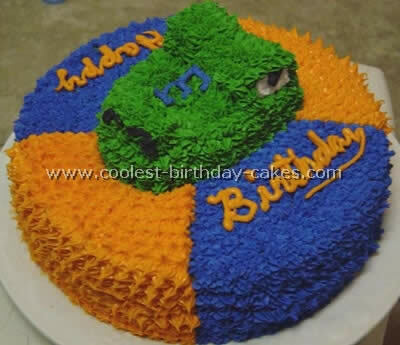 This is one of those kids birthday cake ideas that is very easy to do. I just star tipped everything. I had to draw an outline of the stem, eyes, nose and mouth first. It was a hit with all the kids and parents. 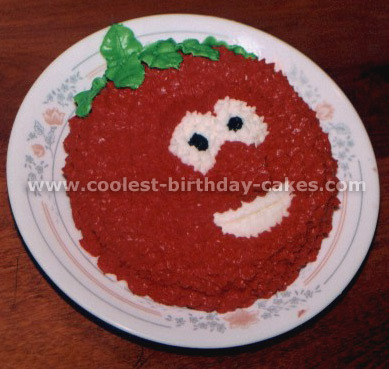 I made the little Bob the Tomato cake for the birthday boy using a Pyrex bowl to bake the cake and then inverting it onto the plate for decorating. 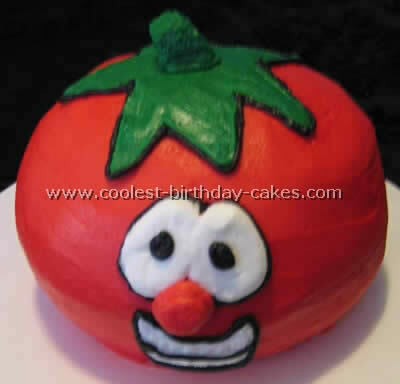 I gave it the 3-D effect by putting an extra layer of frosting on the veggie tale eyebrows, eyes, nose and mouth. I used a leaf tip to make the top.